NASA astronaut Karen Nyberg images her eye with a fundoscope (an instrument used to examine the inner eye) aboard the International Space Station during the Expedition 37 mission in 2013. Researchers may now know why spaceflight is so hard on the eyes — and what to do about the problem. The likely culprit is the lack of a day-night cycle in the pressure inside astronauts' skulls, a new study reports. This finding, in turn, suggests a possible fix: the use of some sort of vacuum device to impose that cycle. The eyes suffer as well. Indeed, nearly 30 percent of American space shuttle crewmembers noted a loss of visual acuity after returning home from their two-week missions, according to a 2013 report by the U.S. National Academy of Sciences. 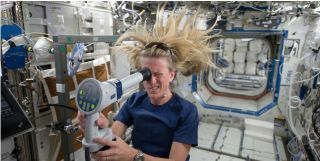 For ISS astronauts, who serve roughly six-month orbital stints, the figure is 60 percent. Such vision issues can be serious and long-lasting, or perhaps even permanent, and thus are a subject of much concern for NASA, which is working to get astronauts to Mars sometime in the 2030s. It takes six to nine months to fly from Earth to the Red Planet using current propulsion technology, so the eyes of Mars pioneers would be at even greater risk than those of ISS astronauts, if no mitigating measures were taken. NASA researchers, as well as scientists from various institutions around the world, have been investigating the problem intensively as of late. Their work has traced astronauts' visual impairment to increased intracranial pressure during spaceflight, which causes cerebrospinal fluid to push on, and slightly deform, the back of the eyeball. The new study helps tease out exactly what is going on, team members said. The researchers recruited eight volunteer patients outfitted with "Ommaya reservoirs" — catheter systems implanted in the head as a way to help treat cancer. The reservoirs allowed study team members to measure the patients' intracranial pressure. These eight volunteers then flew on NASA airplane flights that achieved 20-second periods of microgravity via repeated parabolic maneuvers. The researchers measured the volunteers' intracranial pressure during these weightless stints, and compared those pressures with the pressures observed while the patients were sitting, standing and lying down here on Earth. "These challenging experiments were among the most ambitious human studies ever attempted as part of the Flight Operations parabolic flight program, and changed the way we think about the effect of gravity — and its absence — on pressure inside the brain," research team leader Benjamin Levine, a professor of internal medicine at the University of Texas Southwestern Medical Center, said in a statement. The researchers found that intracranial pressure in microgravity conditions is higher than that experienced while sitting and standing on Earth, but lower than that experienced while lying down on terra firma. This makes intuitive sense; on Earth, gravity tends to pull blood and other fluids down from the head toward the feet when people are standing or sitting, but not so much when they are lying down. The results suggest that the constancy of this intracranial pressure is what degrades astronauts' vision in space, the researchers said; space fliers' eyes don't get the 16-hour break that ours get here on Earth, as we go about our waking (and walking and sitting) day. The researchers are studying ways to give astronauts' eyes such a break. In previous experiments, they've shown that a vacuum-like device that fits over the lower body can lower intracranial pressures when applied for 20 minutes at a time, study team members said. The plan is to increase the application time to 8 hours and see what happens, they added. "Astronauts are basically supine the entire time they are in space," said study lead author Justin Lawley, an instructor in internal medicine at UT Southwestern. "The idea is that the astronauts would wear negative-pressure clothing or a negative-pressure device while they sleep, creating lower intracranial pressure for part of each 24 hours." The new study was published this month in The Journal of Physiology.